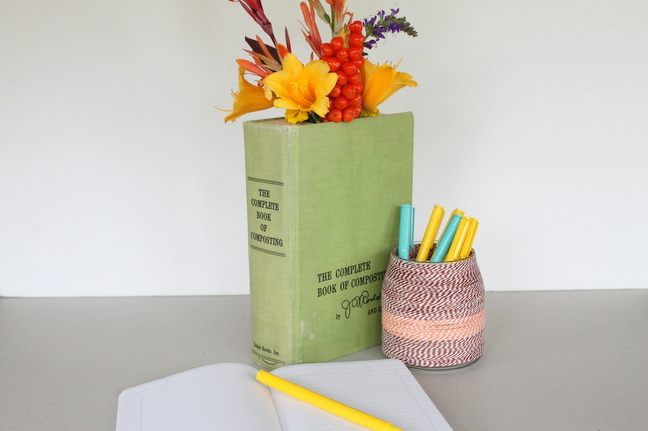 I love turning thrift store finds into unexpected items, and that is exactly what happened in the case of this DIY Book Vase. 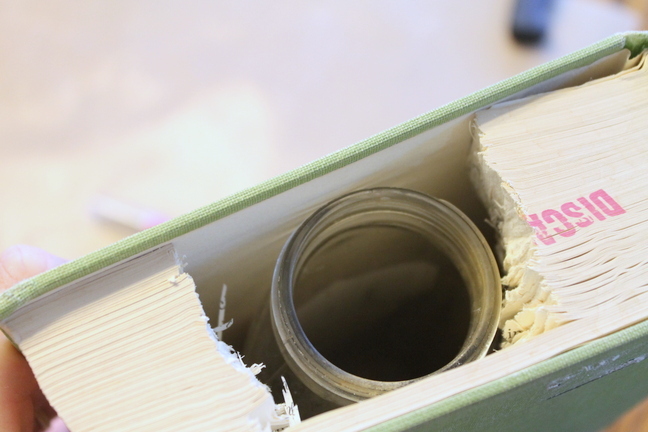 I simply took a cast off vintage book and added a bottle to the inside for an easy DIY with great home decor results. Now, flowers can be displayed in style throughout my home. The best part of this project is it won’t cost you much to make; my book and bottle were less than a dollar at the local thrift store. 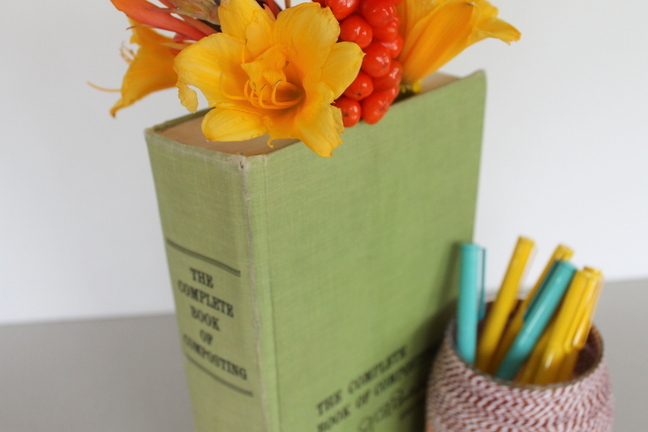 Want a book vase of your very own? Grab a book and lets get started! Step 1: Begin by using decoupage around the top and side of your book. 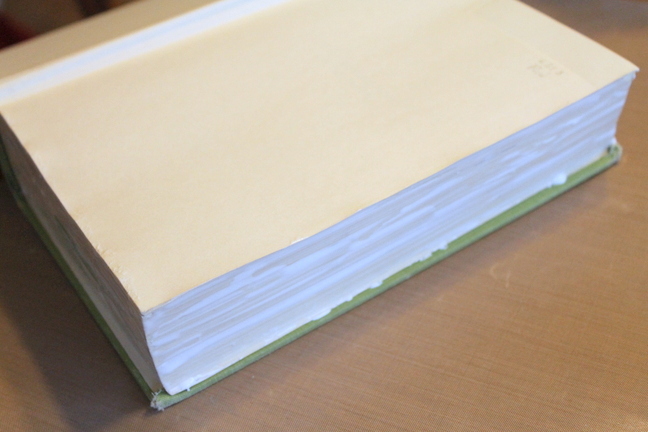 You want the pages to be glued together before you begin. Step 2: Allow this to dry with the cover open. 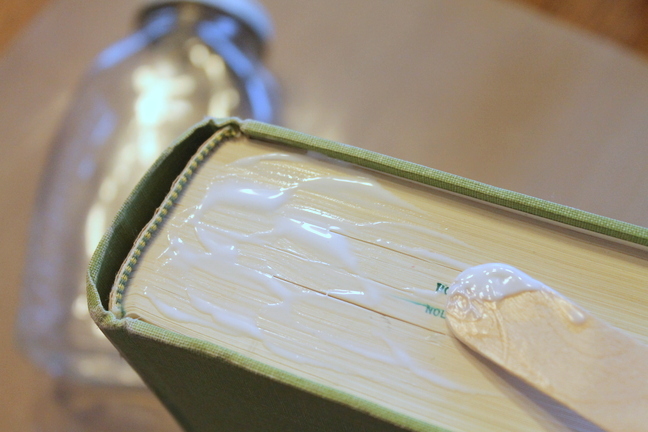 You do not want to glue the front of the book closed. 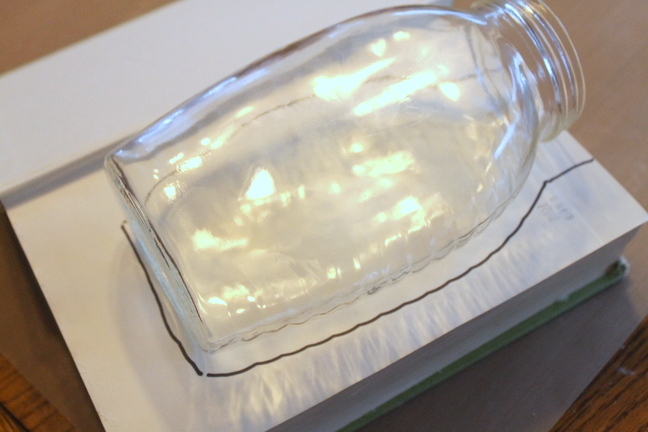 Step 3: Next trace around the bottle onto the first page of the book with a pen or marker. 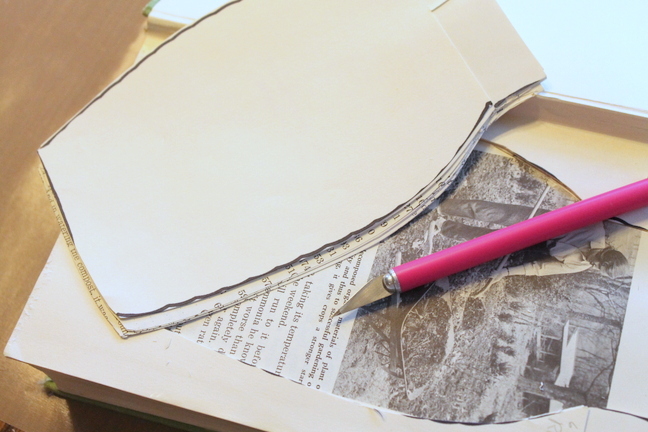 Step 4: Then just start cutting that area with your craft knife and removing small amounts of pages at a time. NOTE: Always be cautious when using a sharp craft knife. Watch your hands, body, and surfaces. 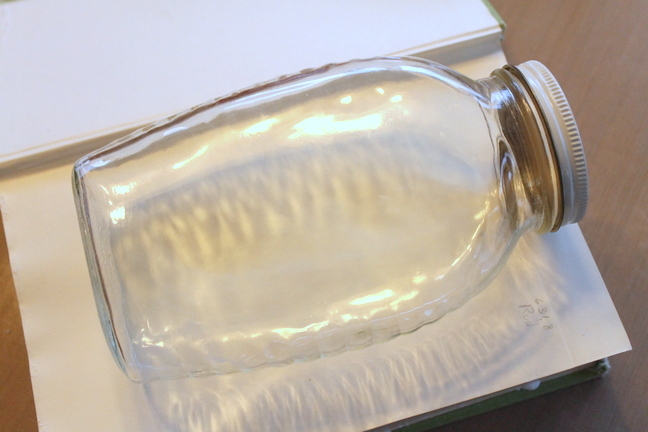 Step 5: Continue until your bottle of vase will fit inside your book. This may take a while. Pop in a movie and cut away the pages of your book. Once your bottle will fit inside and your book will close you are ready for the next step. 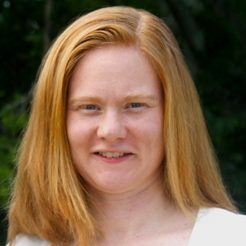 Angie Holden is a blogger, wife, and mother of three great kids. Angie blogs regularly at about crafts, recipes, DIY, and her home. 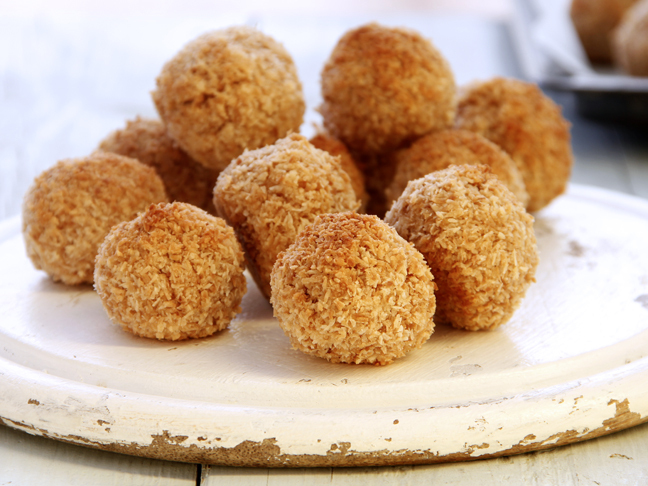 Most of Angie’s recipes are quick and easy, yet delicious, because who has the time to spend hours in the kitchen these days? Angie believes we all can cook meals for our families with great, easy recipes that even the culinary-challenged can master. Join Angie at The Country Chic Cottage for great recipe ideas and more creative fun.